R.P. 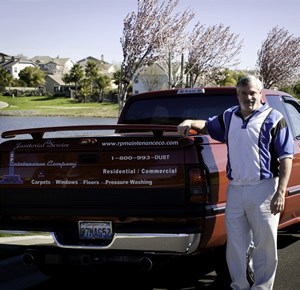 Maintenance is specializing Carpet Care & upholstery cleaning. Owner Ronnie Munoz’s love for his job and perfectionist attitude ensures that each job is completed thoroughly and personally. His philosophy is to educate customers on the services he provides so that carpet and upholstery are easy to maintain and last longer. R.P. Maintenance does carpet cleaning, including area rugs, and hand cleaning upholstery, including leather. Clean carpets and area rugs. Dries in hours, not days. (NOTE: We clean with no steam) Bonnet cleaning is a restorative and deeper cleaning than the other methods of carpet cleaning. Upholstery cleaned by hand. We apply Stainshield carpet protectant. Carpet maintenance programs available. If any spots come back, we’ll be back for free! Homeowners should know that the Asthma & Allergy Foundation Of America recommends our method of carpet cleaning, the Bonnet Cleaning System, which is the safest and most effective method of carpet cleaning for people suffering from allergens, mold and mildew with No Steam. Call about our special packages and services!